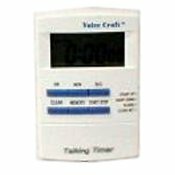 Voice/zone Talking Timer has 3 independent functions. You can use the count up timer, the talking count down timer or the talking clock simultaneously or independently. The auto repeat feature re-starts the countdown after reaching zero. 6 alarm sounds to select from when setting alarms for different activities. Has a memory for 1 special timer setting. You can turn the voice announcement on or off. The maximum count is for 23 hours, 59 minutes an 59 seconds. Magnetic Clip on back and easy flip stand on bottom.